Do you like to play with sparks? Electrical Age is a DC electricity simulation. 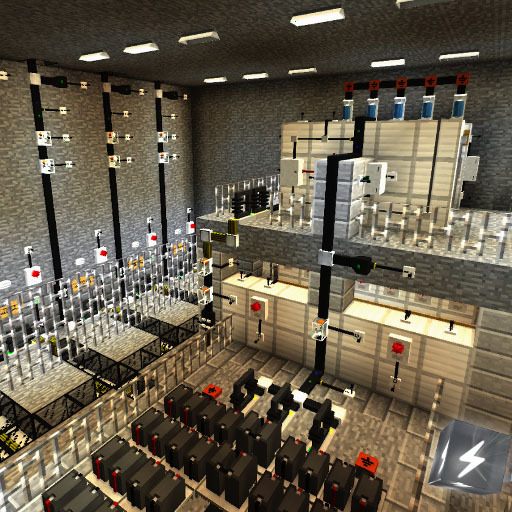 This is not IC2 power, and certainly not RF: It uses state of the art simulation techniques to simulate real-life direct current inside of Minecraft. It is, for the most part, accurate and true to life. Sometimes this means explosions, but they're the sort of explosions you learn from. Visit our support channel, we'll be happy to teach you the basics. Visit Wikipedia; the items you can find in Electrical Age act like in real life, so most things you read there are useful. Visit the dev server, if you have a reasonably powerful computer and would like to play with others. We are currently recruiting writers for the wiki! If you can write English, and you're willing to spend the time documenting your early attempts at making something work, then we'd be overjoyed to assist. Real electrical simulation model (with resistive, inductive and capacitive effects). Behaviour similar to those of real life objects. We're not talking IC2 here, folks: This is an actual MNA solver. You won't believe it's not redstone! A completely new logic system featuring XOR, NAND, AND, signal processors, buttons, switches, display screens, wireless transmission and more... using floating-point values. Actually quite useful. Old redstone circuits can be exploited with electrical - redstones converters. If that isn't enough, break out your OC computer! Ran out of power? Buildcraft oil wells come quite in handy. two years and no news. Modding api to use to connect to power ?????? Will minecraft be available for 1.12.2 Update? Will he go to 1.12.2? don't waste your time ppl, they will never update. 1.12.2 soon would be amazing. Updating the mod to a newer minecraft version would allow us players to not to be stuck with 1.7.10 when creating modpacks. As a coder myself, I know it is a lot of work. But take it like this: The longer you wait, the worse it will get when you ever want to update. As far as I know, the developer was working on a new version for the 1.10 version of minecraft, but I don't know when will it be released. I asked to don-bruce. A mod developer that made some tutorials of the mod. I just now was replying to a rare comment on one of my tutorials and decided I should check on this mod. Saw this comment and would like to mention that while I did say that, it was many moons before the date the comment was posted. IIRC, EA started their update journey back in early to mid 2017, as I remember having my server still when I was talking with the devs. While I do see activity on the GitHub as recent as October of last year, the pacing makes me worried that EA will never see another major version update. Either that, or it'll take a very long time like Millenaire did. i must join to the requests below. This mod is the best one for electricity. We need it on the newer versions of MC (1.12.2 for example). Is it possible to port it to that version? update this mode, I really like this mode but I do not change the minecraft update without it, no more immersive and real mode than it, and it entertains me and holds me for a long time, please update the mode. Is there any alternative for 1.12.2? The development of the mod has been abandoned ?